This flavourful, protein-powered pudding packs an immune-boosting, beta-carotene loaded, vitamin C-filled punch! 1. Chop the squash into cubes. 2. 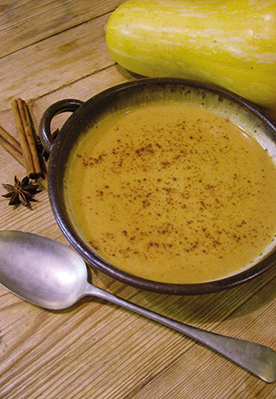 In a medium saucepan, combine the squash and coconut milk. If one can isn’t enough to cover the squash, add a bit of spring water until just barely covered. Turn the heat to medium-high and bring to a slight boil. 3. Reduce the heat once the mixture begins to boil and cover, cooking on a low heat or simmer until the squash is soft enough where a fork will pierce through easily. 4. Remove from the heat, let it cool slightly for several minutes, and pour the mixture into a blender. Add the remaining ingredients, and blend on high until smooth, adjusting the taste and sweetness as needed. 5. Pour into bowls or ramekins and place into the refrigerator for a few hours or overnight to set. 6. Dust with cinnamon and enjoy! To add a flavourful twist add a pinch of saffron into the squash coconut milk mixture while it cooks and 1 teaspoon or capful or rosewater to the blender. The result will be a wonderfully delicate and exotic Mid-Eastern sensation.